At The Workout Company we provide everything you need to get in the best shape of your life, not just exercise equipment. Cardiovascular Training: Offering the latest in cutting-edge cardiovascular equipment: Precor EFX Elliptical Crosstrainers, Concept2 Rowers, treadmills, stair climbers and bikes. Group Classes: From spinning to step to abs to yoga: our classes are all taught by certified instructors who are excited to help you meet your personal fitness goals. 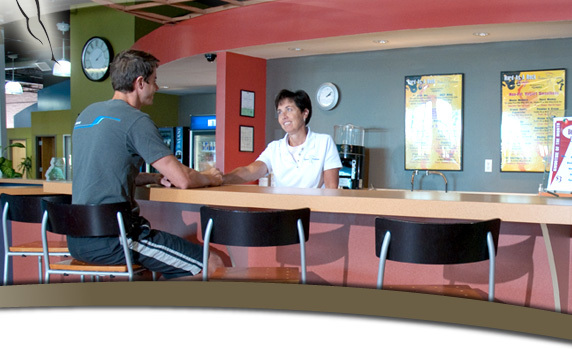 Nutritional Counseling: Including individualized meetings, meal plans, personal training and eduction. Child Care: We offer FREE supervised childcare for the convenience of our members. Juice Bar: We offer a full line of supplements, vitamins, power bars and shake products to assist you in achieving your nutritional and fitness goals.